The original MTB bar, as approved by Tom and Charlie- with a few small design updates to make it perfect for threadless steerers. 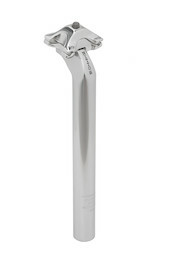 Highly swept one-piece bar and quilled stem combo as seen on the opriginal Ritchey clunkers. These one-piece, twin extension beauties have never been inexpensive to make, but they're worth every penny. Available in either fillet brazed or TIG welded construction (subject to availability). In a world of modern, mass produced composite parts the Nitto B903R Bullmose handlebar is the real deal. For 1" 1/8th threadless fork. Dull is the silver version, KDP is the black version.